YES. Don’t get me wrong, all of this is so great, but Greta Gerwig is especially great! Oh, how her earnest dance moves and backup troupe of indie moppets warm the cockles of my heart! And that’s mighty impressive considering the crap I’ve eaten! That tired lump should’ve stopped ages ago! 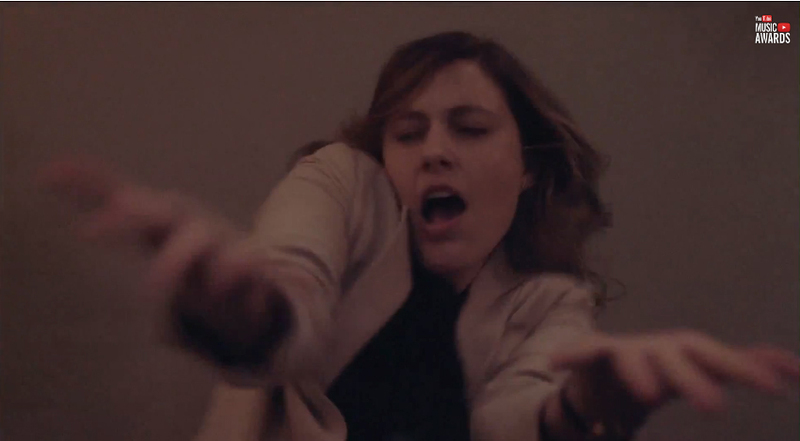 Dance, Ms. Gerwig, dance dance dance dance DON’T GO NEAR THAT TRAIN! And speaking of things I’ve put in my mouth, this performance has gone and given me a case of the feelings. Again. Now where’d I put my eatin’ bib? This entry was posted on Friday, November 8th, 2013 at 11:06 am and is filed under Music and Video. Tagged: Afterlife, Arcade Fire, Dancing, Greta Gerwig, Internet Gems, Reflektor, Spike Jonze, YouTube, YouTube Music Awards. You can feed this entry. You can leave a response, or trackback from your own site. « Nicolas Cage as Miley Cyrus in “Wrecking Ball” Because Why Not?